County Commissioners in one North Carolina County unanimously passed a resolution on Tuesday, October 17 expressing concerns over the Atlantic Coast Pipeline what they term a development dead zone. The resolution states that the proposed natural gas pipeline will cause a development dead zone 1,300 feet wide by 12 miles long running through “the heart of Wilson County”. The resolution states this dead zone will lower property values and adversely affect the citizens of Wilson County. Wilson County commissioners also called upon Atlantic Coast Pipeline representatives for full and complete disclosures and transparency in their dealings with property owners and for fair compensation to all parties affected by the pipeline (see the full resolution here). PIPA also provides model ordinances for local jurisdictions wanting to adopt rules to “enhance pipeline safety”. These suggestions include mandatory consultation with pipeline operators before any permits would be issued for development of property. The model ordinances also suggest any new development be designed so as to “reduce the consequences that could result from a transmission pipeline incident”. Most of the control measures include design and location measures (see ND11 – ND23 here). 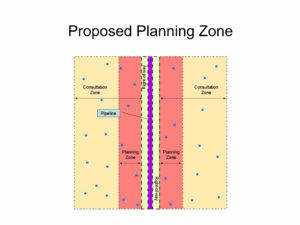 One PIPA recommended practice, labelled ND20 “Reduce Transmission Pipeline Risk through Location, Design, and Construction of New Institutional Land Use Developments”, includes such uses as schools daycares, hospitals, nursing homes, and prisons. Among the suggested measures are enhanced fire protection of buildings, and egress models.